After Bashir, A New Dawn in Sudan? The coming weeks will be critical in shaping the country’s future. What can the international community do to help? The dangers, and the responses needed, in Libya’s outbreak of fighting. Rehabilitation of those exiting violent extremism requires strategic language. USIP works in 51 countries facing warfare and extremism, from Iraq and Afghanistan to Burma and Nigeria. On any given day, our staff work with partners in prime ministers’ offices and parliaments—and in refugee camps and community centers—building peaceful solutions to bloodshed. USIP is America’s nonpartisan institute to promote national security and global stability by reducing violent conflicts abroad. Our staff guide peace talks and advise governments; train police and religious leaders; and support community groups opposing extremism—all to help troubled countries solve their own conflicts peacefully. USIP circulates a variety of newsletters and announcements with the latest analysis, publications, and events. 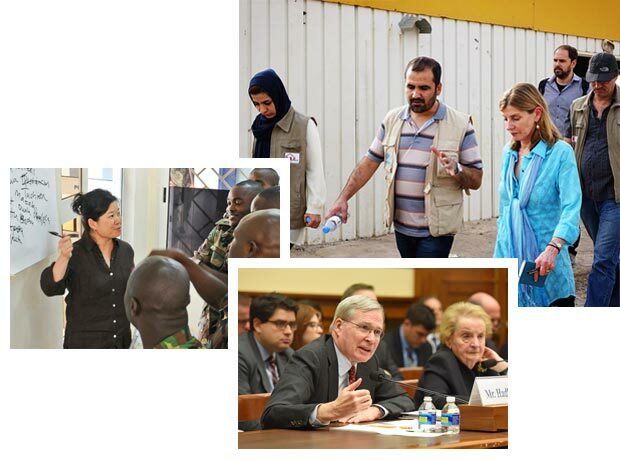 Follow USIP and our work around the world on social media. Since 9/11, the United States has successfully prevented another mass-casualty attack on its soil. But despite trillions of dollars spent and tens of thousands of lives lost, terrorism is spreading. We need to adopt a new prevention paradigm, one that not only responds to terrorism but also prevents the underlying causes of extremism and violence in fragile states.